My legs are spinning, but I’m not moving. It’s early morning, and I’m halfway through a spin class at Rancho Valencia. Beads of sweat gather on my skin, roll off and crash to the floor. My ears are filled with a heart-pumping soundtrack and the motivational outbursts of my uber-fit instructor. Suddenly I’m greeted at my stationary bike by a smiling fitness attendant. “Would you like a fresh towel or bottled water?” she asks. When I finally realize why I’m not running her over, I nod yes, and manage to squeak out a faint, “Thank you.” Thirty minutes later, our goal achieved, we dismount and towel off, when my fitness angel/attendant again appeared — offering the class a tray of frozen chocolate and peanut butter protein smoothies. It wasn’t champagne on the last day of the Tour de France, but I couldn’t imagine it tasting any better. 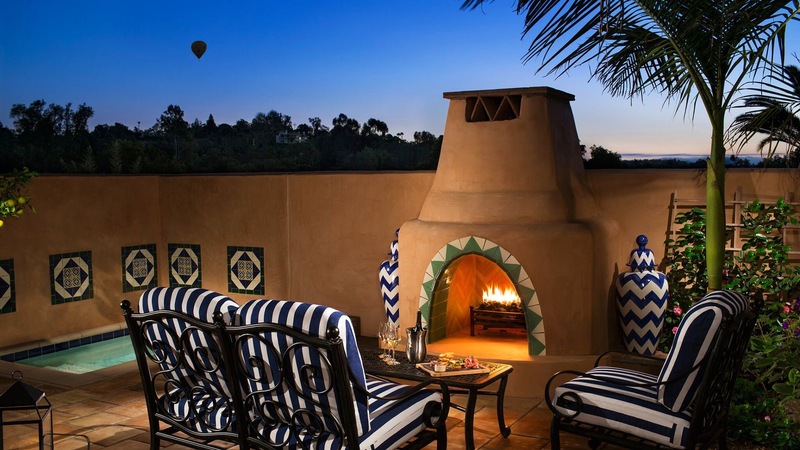 Since opening its doors in 1989, the award-winning Rancho Valencia Resort & Spa has garnered a reputation as a sought-after luxury resort. 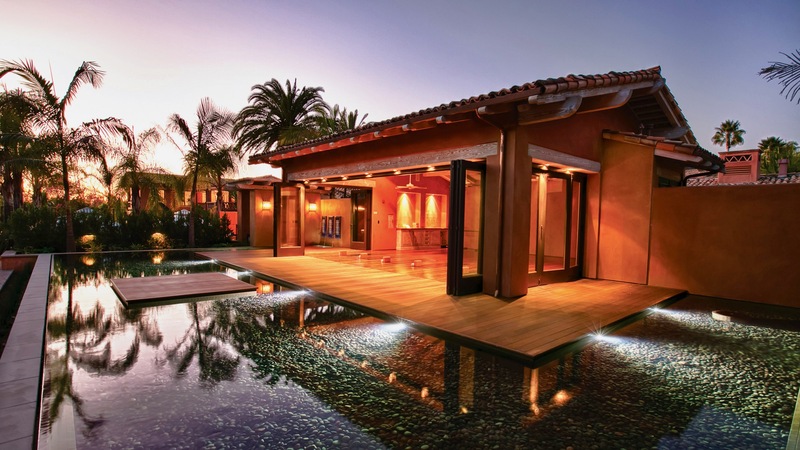 This sanctuary of good living is tucked away on 45 acres of lush gardens and olive groves, in the oasis of Rancho Santa Fe, 35 minutes north of (downtown) San Diego. The Mediterranean-inspired all-suite property recently completed a $30 million renovation including remodeled guest casitas, a brand new restaurant and bar, and major enhancements to the spa and fitness center. 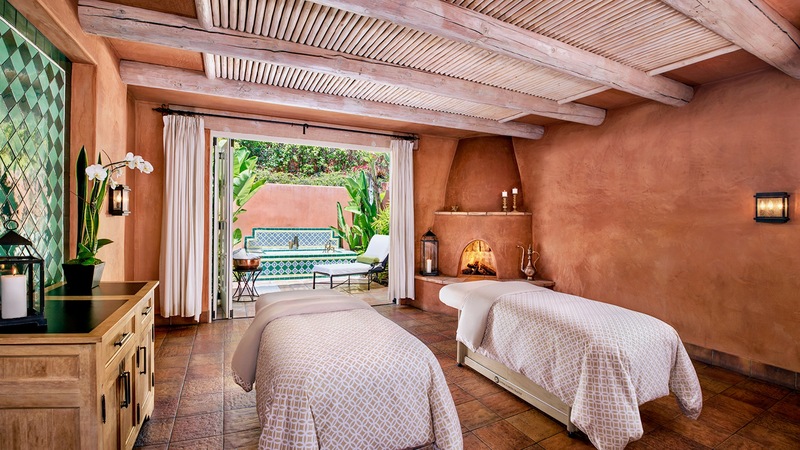 The Spa at Rancho Valencia embraces the spirit of Southern California. Merging outdoor and indoor together, it’s an experience for all the senses: birds singing, fountains splashing, green foliage against blue skies. In a word: heaven. I had the pleasure to enjoy two treatments, starting with a 90-minute Sixth Sense Ritual. My treatment began with a soak in my own private outdoor bathtub — a welcome opportunity to relax the body and mind, as well as my muscles and joints from the morning spin class. After 30 minutes, I got the courage to get out, then toweled off and slipped under the cool, fresh sheet, as instructed by my therapist. When she returned to the room, a very relaxing massage followed, including a Harmonizing Scalp Massage with organic Mediterranean myrtle, juniper, and organic jojoba, avocado and olive oils. The experience culminated with a relaxing hand and foot paraffin treatment. My second treatment was a 60-minute Gentleman’s Facial. Simply put, it was one of the best facials I’ve ever received. I usually drift off during a facial, but not this time. I was very relaxed in the company of my talented aesthetician, who, after closely examining my skin, suggested a cocktail of Amala and Epicurean products to clean and hydrate my face. 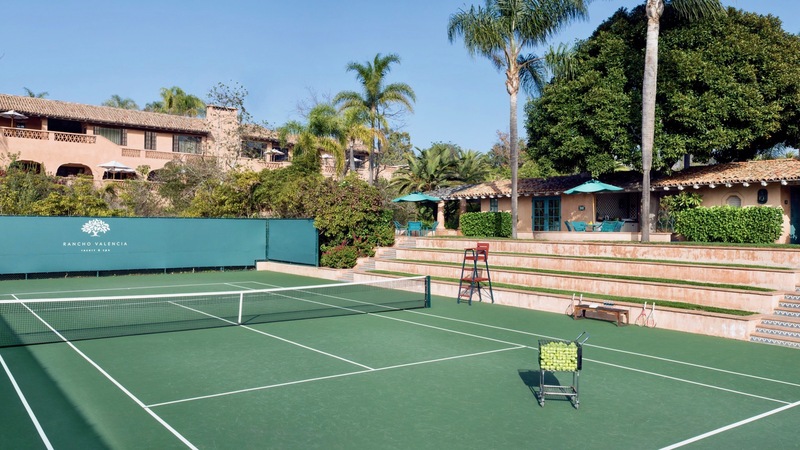 I was impressed by Rancho Valencia’s commitment to personal wellness. They offer more than 75 health and fitness classes each week. Led by top-tier wellness professionals, there’s a class for every visitor: high energy cardio workouts, weights and circuit training, TRX, spin, Pilates and a variety of yoga teachings in the beautiful Serenity Yoga Pavilion. For those seeking adventure on the water, stand-up paddling and surfing are 20 minutes away in Del Mar, and Torrey Pines State Park offers a welcome escape for guests looking to connect with nature. Dining at Rancho Valencia is colorful, beautiful and simply delicious. Under the stewardship of Executive Chef Eric Bauer’s farm-to-table philosophy, the resort operates two distinctive restaurants. The more formal Veladora offers guests a fresh and delicious dining experience – morning, noon or night. The warm and youthful Pony Room offers an ideal setting for a light meal, a tequila sampling, or a hand-crafted cocktail on the terrace. Rancho Valencia’s wine collection would make any sommelier blush, with over 600 hand-selected wines available. 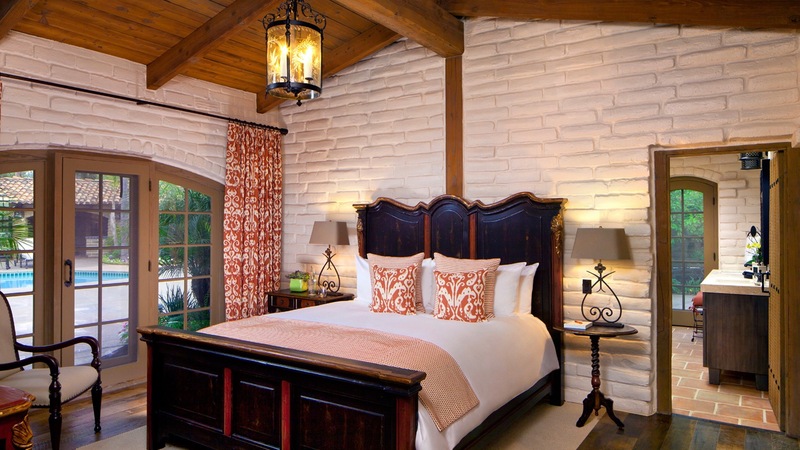 The digs at Rancho Valencia (which feel like a private home) were stunning. The 49 luxuriously appointed casitas offer every convenience imaginable: spacious bathrooms, large closets, open living rooms, and sliding doors that welcome you to your very private terrace, many with outdoor fireplaces and soaker pools. Each fridge was stocked with complimentary beverages and snacks. The pièce de résistance was waking every morning to find, at my door, freshly squeezed orange juice, made right on property. Each morning I enjoyed my juice on the terrace. Just me, the sunshine, and the sound of a hummingbird going about his business. As beautiful as the resort is, it’s the people who leave the greatest impression. The staff of Rancho Valencia, under General Manager Simon Chen, performed with warmth and attention to detail. From the smiles when I arrived, to the Pony Room staff who made a point of introducing themselves to me and the Veladora staff who remembered what I couldn’t eat, to all the tennis, fitness and spa professionals who enhanced all my experiences, this “cast” is why Rancho Valencia continues to be an award-winning production.